Quirks of fate – even accidents – can sometimes create unexpected outcomes. Back in 1992 I was one of a relatively small band of UK IT analysts. It was in the days when you would go to a Misys briefing only to sit next to an analyst whose main role was on the Oils Desk of a particular broker. So I tended to be in demand by journalists requiring a quote to enliven their otherwise rather turgid articles on company results. In 1992, I was phoned by Alan Cane, the IT correspondent of the Financial Times, to give my views of Clay Brendish’s Admiral’s results. Admiral was at that time a lead ing UK IT Services player and nothing to do with insurance. They were later bought by CMG for a massive £1.4b (about 8x revenues…) in April 2000 at the very height of valuations of tech companies and literally days before the ‘bubble burst’. Admiral in 1992 was somewhat of a ‘poster child’ for the IT services. Their revenues and profits just kept going up year after year after year. My comment to Alan Cane was that I thought Admiral’s results were ‘boringly consistent’. Unfortunately this seemed to be interpreted as ‘Leading UK Tech analyst, Richard Holway, thinks that admiral is Boring”. I was then regaled with comments like ‘We’re just as Boring as Admiral’. The company lost its on-going Boring Award if it ever failed those tests. But we never took away Boring Awards when companies were acquired. 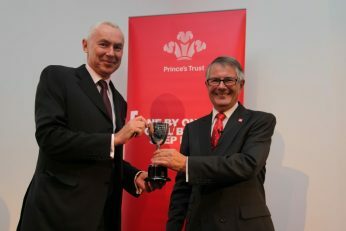 Admiral was obviously the first Boring Award winner in 1993 and I actually had a cup (Cost around £50 from the local sports trophy shop) produced and presented it to Exec Chairman Clay Brendish at the annual Holway Evenings that I ran with CSA/CSSA/Intellect and now techUK since 1988. Admiral was swallowed by CMG in 2000 so we never got to see how Admiral would have weathered the Y2K Meltdown and Dot.com crash. Probably a very lucky ‘just in time’ escape. The second recipient was Triad and Alistair Fulton received the treasured trophy. Triad held the award for an admirable 6 years but eventually fell on ‘hard times’ and was stripped of its Award in 2000. They seem to be doing quite nicely now. So, you never know, they might get it back in 8 years time! CODA who managed to lose its award in the same year (1994) as it was awarded. At the time I said I had never got my views on a company so badly wrong as I had done with CODA. JBA (awarded in 1994 and lost 1998) All these companies lost their awards before we could present it to them. Clearly ‘past performance is no indicator of future performance’ as they say. 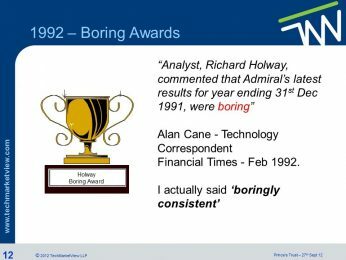 I was invited to address the Hoskyns Annual Sales Conference in 1996 and awarded them an Honorary Boring Award for their performance in the 1980s before they were acquired. But the two most famous’ and longest holders of the Holway Awards were Sage & Capita. Both IPOed in 1989. I had the real honour of presenting David Goldman with his actual Boring Award cup in 1996 – as he died a few years later. Both Sage & Capita retained their Boring Awards until 2016 when they both lost it. 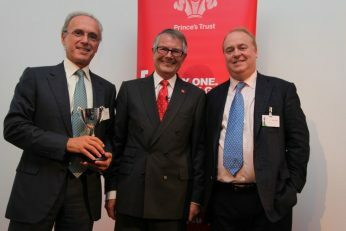 On my very last Annual presentation for the Prince’s Trust in 2012, I presented Paul Walker (who joined Sage in 1984 and was CEO in 1994 – 2010) and Guy Berruyer (the CEO of Sage from 2010 until Stephen Kelly took over in 2014) and Paul Pindar (who joined Capita in 1987, jointly ran it with Chairman Rod Aldridge and was CEO until Andy Parker took over in 2014) with ‘new’ Boring Awards. 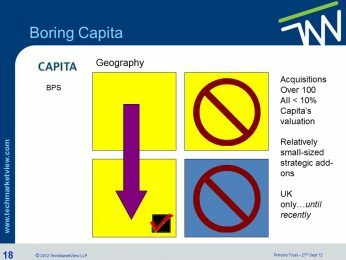 Both Sage and Capita have lost their Boring Awards in the last two years. But long-term shareholders have still done well. 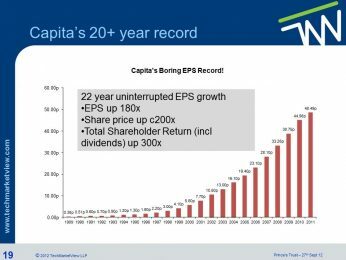 Although Capita’s share price halved in the last 18 months after a series of profit warnings leading to the removal of Andy Parker as CEO (a replacement is still awaited as I write) their share price is up 20% in 2017 YTD and is still up 200x since its IPO in 1989. Sage’s share price has more than doubled since Stephen Kelly was appointed CEO in 2014. Kelly has really put new fire in Sage’s belly. 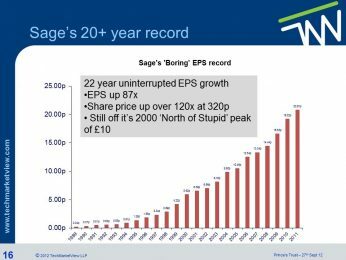 Long-term Sage shareholders are still enjoying a 260x times increase in the their share price since the 1989 IPO. 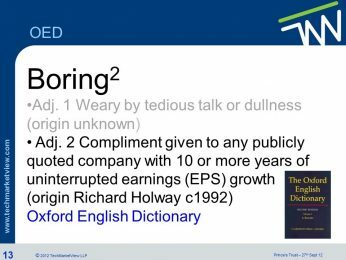 Boring can be very rewarding too!  2 – Strong brand identification. Everyone knows what they do. 3 – They only expand geographically in their own market area. In other words, if you are good at doing ‘A’ in the UK, you might stand a chance of being able to do well at ‘A’ in France or the US. You will undoubtedly fail if you try something new in a new geography. 4 – Strong and Stable management. Before Teresa May devalued that phrase, it really did mean something. All Boring Award holders were run for decades by the same top managers – most often their founders. 5 – They avoid Acquisition Indigestion. 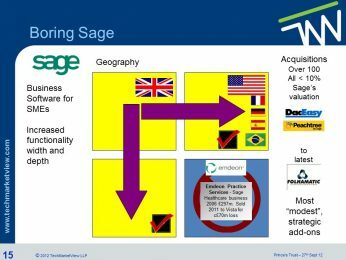 Sure, Boring companies do lots of acquisitions – Sage and Capita acquired many companies every year. But firstly they tended to be in areas or geographies they knew well. And also they tended to be relatively small – never > 10% of their then market cap. As your doctor will tell you, to avoid indigestion, eat small meals regularly. Big blow outs can sometimes be fatal! Will we ever see another ‘Boring Award’? Consistency is extremely difficult to achieve. Also, in these days of disruption and fast moving markets, 10 years is a very long time! Sage & Capita both start off at Year 0 – so have a decade to wait until I make another visit to the Farnham Sports Trophy store. Micro Focus – now the UK’s most valuable software company at £10b post the completion of the HPE Software merger/acquisition, came within a whisker in 2016 of getting an award. But they did record an unusual dip in EPS last year. So they will have to wait at least another 9 years. All other currently quoted UK SITS players will have to record 5 or more further years of uninterrupted growth. So, I guess Boring Awards are really a thing of the past. Fun whilst they lasted though.